It’s got colder since the weekend and frog activity has diminished. In an hour or two of sun this afternoon, I saw just two, one swimming to the side and another perched on a sack of barley straw that we put in last year to try and keep the water clear. However, when I’d climbed back up the hill and had stopped to lean on the gate and give the sheep a visual once over, a buzzard glided down onto one of the apple trees half way between me and the pond and then, as I kept still, it swooped down to the pond edge and started walking around the clear side of the bank, picking up bits of dead leaf and grass, presumably looking for afternoon tea. Buzzards like an easy meal – will happily eat carrion – and I suspect he was looking for a frog or two. I believe frogs tend not to eat while they’re in the mating process and if they’re not in robust health, it’s not unknown for them to lie down and die after fulfilling their biological imperative. So perhaps Mr Buzzard got lucky and found a snack or two. I’ll keep a lookout for him to see if it’s on his regular beat now. This past week, frogs (Rana temporaria – Common Frog) have started migrating back to the pond for spawning purposes. Since we re-instated the pond about 3 years ago, the frog spawn season in this part of southern Normandy bocage seems to be increasingly early. Alerted by our ever-vigilant cats, we realised something was going on down in the pond on Friday. 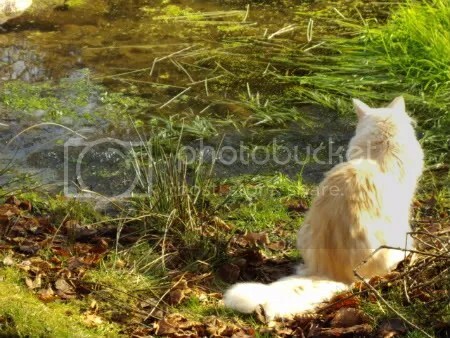 When our cats sit around a pond staring down in rapt attention, you just know that something is going on. We went down to the pond expecting to see our spring visitors – a couple of ragondin (coypu) – but no, the cats were watching the amorous activities of a pool full of frogs. 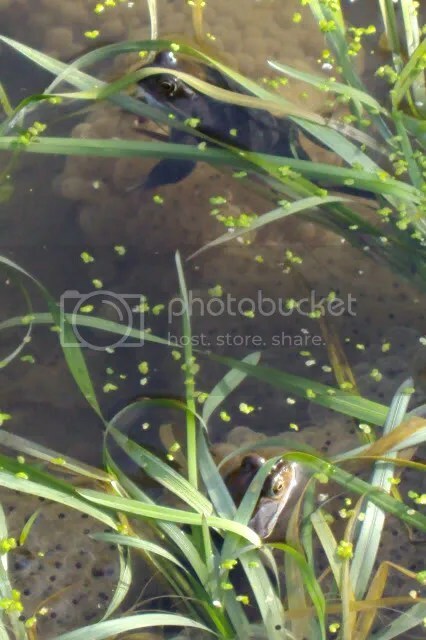 Having walked down to the pond and seen the frantic departure of the frogs for the cover at the bottom and around the edges of the pond, we headed back up the hill for the camera. We discovered the frogs are surprisingly aware of movement – well, those that weren’t practising limb knitting in groups were – and it was difficult to get sufficiently close to get a good photograph to show the sheer volume of creatures. I have to say, though, that as a reliable point-and-shoot, it can deliver some very reasonable close shots. 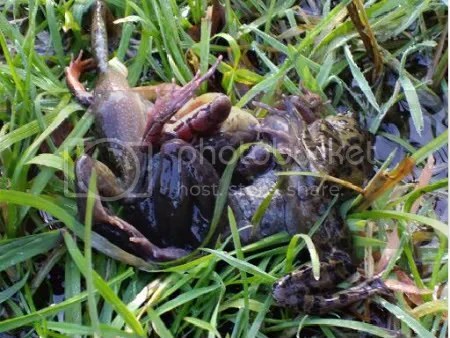 Eventually, they did all detach themselves and slip into the water under the cover of grass. 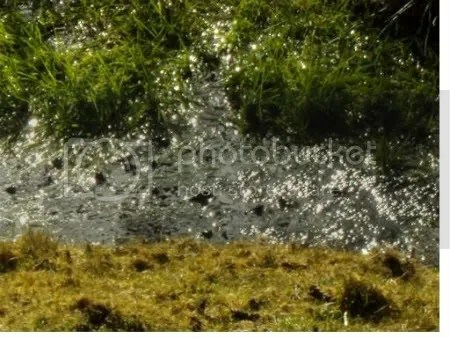 …and if you look closely, the photo does begin to give an impression of how much frog spawn has been laid. Frogs and toads mate by the male holding the female around the chest. When the female pushes her eggs out, the male is in position to overlay his sperm on the emerging eggs. Frogs lay clumps of spawn; toads – who usually produce their eggs a few weeks later than frogs – lay their eggs in strings. Frogs prefer shallow water – say around 9 inches deep whereas toads prefer deeper water of around a foot deep.